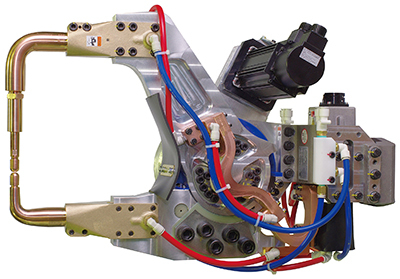 Dengensha America, Bedford, OH, has developed a high-force, lightweight, reduction-gear X-Gun that proves extremely effective for resistance-spot welding of high-strength steels. With its new high-torque reduction gear, it can achieve an electrode force ranging of 4.8 to 7 kN. The new, proprietary lightweight design features an aluminum gun arm; total weight ranges from 90 to 97 kg. This same proprietary design enables the X-Gun to operate seamlessly with Dengensha’s newly developed heavy-duty lightweight MFDC transformer. Users can count on a maintenance-free reduction-gear drive unit that is adaptable with a high-speed servomotor. Use the X-Gun with robots from Fanuc, Nachi, Yaskawa, Kawasaki, Kuka and ABB.